The 2014 Puddle Duck Racer World Championship Race will be Saturday June 14th on Magnolia Beach. Please see this page. PolySail International has been offering PolySail Kits since 1996 and custom sail construction since 2000. PolySail International is also a strong supporter of the PDRacer class of small sailboats because the class is perhaps the only class of sailboats that allows unlimited sails, including polytarp sails, under their competition rules. The motto of the PDRacers "Cheap, creative, and fun on the water" is also very much in line with the PolySail International slogan: "Buy low. Live Slow. Sail Fast!" So, with the PDRacer World Championship scheduled for the Houston area next June, I completed a 47-page free PDRacer construction guide for building my "Redneck Duck" design, a lumberyard materials racing scow that can be built by a novice or by an organization or family for around $400. 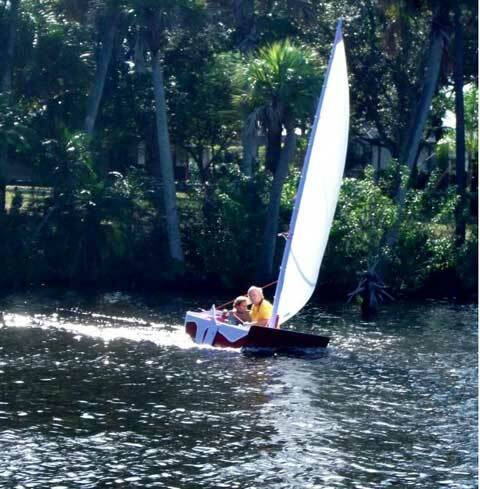 The design was prototyped by a local electrician who had never built a boat previously for and with his 9 year-old granddaughter and was successfully launched a couple of weeks ago here in Port Saint Lucie, FL. The design proved fast and more maneuverable than expected with its 300+ lb. payload powered by its 60 sq. ft. leg o' mutton sail. Here is a PD racer construction manual - pdf printable file. The plans and construction guide are free and formatted in a 6-day "Camp" building format that is simple to follow, and PolySail International hopes that by making these free plans available, we can encourage many new sailors to participate in next summer's World Championship. A large flotilla of Puddle Ducks will be sailing in the Texas 200 this June to raise $'s for cancer. PDRacers might be among the fastest growing dinghy classes in the US now with about 850 hulls registered and probably that many more not registered. Because of the free plans available, it is possible for sites such as yours and mine to host online "hatches" for building these simple and inexpensive sailing craft with online assistance from each other and experts. I will probably do a racing version of these plans with a hatch next spring in advance of the Worlds. Most of the hardware for these boats comes from Duckworks, a Texas boat building supplier owned by Chuck and Sandra Leinweber who are just wonderful folks to know and call friends.